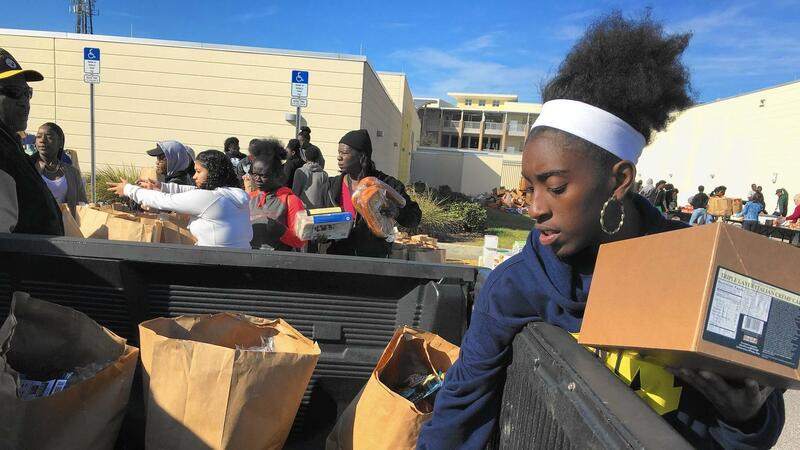 More than 100 students from Evans High School • A Community School volunteered to help with the annual Second Harvest Food Bank of Central Florida holiday food drop Dec. 19. “The food drop program, in its sixth year of operation, was started to ensure Orange County students have food during the holiday break,” reported Caitlin Dineen for the Orlando Sentinel. Learn more about this year’s food drop in Dineen’s article, Second Harvest Food Bank Feeds Hundreds with Event. For photos from the event by Dineen, including the one below, click on “PHOTO GALLERY” in the upper right of her photo in the Orlando Sentinel article (link above).